This post details how to display the current week’s items. Displaying current calendar events and tasks can help keep your site’s home page dynamic and fresh. My example uses a calendar list, but this solution can be used in any library or list with a date field. For non-calendars, substitute the “Start Time” and “End Time” columns as needed. 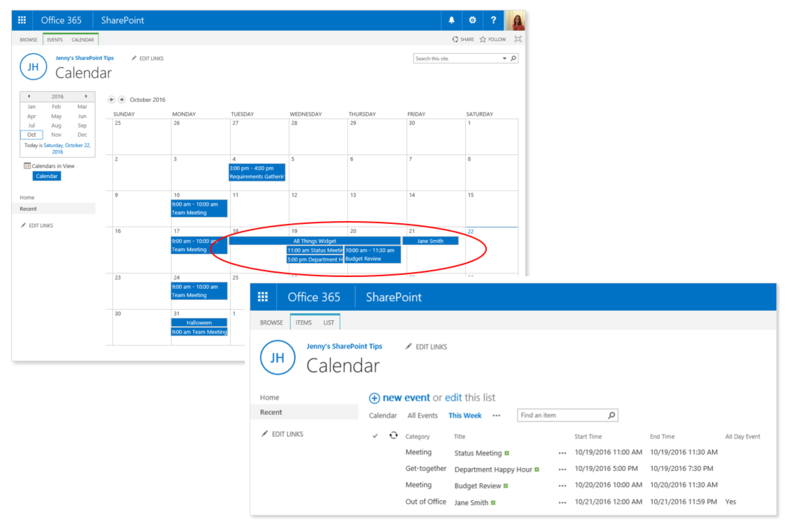 IMPORTANT: Recurring calendar events will not display in the week view. NOTE: This blog assumes you know how to complete the following actions: 1) Create lists, 2) create new list columns, 3) create views, and 4) add web parts to web pages. The example was created using Office 365. Create the below calculated columns in your list or library. NOTE: If you copy the formulas below, replace all opening and closing quotation marks with regular quotation marks. Otherwise, you will receive an error when saving the new columns. To add the day of the week the event or task is occurring, create the below calculated columns, and then add the “Day” column to the “This Week” view.